Je n'ai que fait mes devoirs. I only did my homework. Nous n'avons regardé qu'un film. We watched only one film. Notice that whereas with ne ... pas (not), pas could only be placed after the auxiliary verb (être or avoir) in compound tenses. See Using 'ne ... pas' with compound tenses (negation). The restrictive que in ne ... que can be placed either after the auxiliary verb, or in front of the word it's restricting. You should place que in front of the word you restrict. 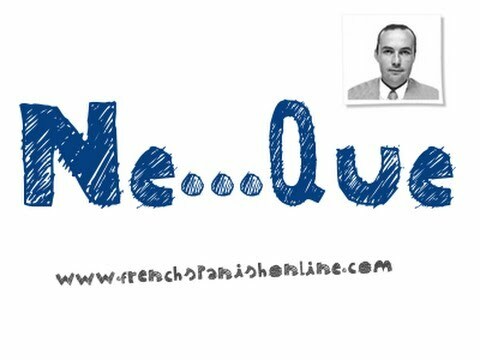 Note that ne is always placed in front of the auxiliary verb, BUT que can never be in front of the auxiliary verb. I only WENT to the cinema. vs I only went to the CINEMA. -> Here the restriction in on the action of going, meaning I've only DONE this, only this action. -> Here the restriction is on the destination, meaning I only went THERE, only this place. Je suis seulement allé au cinéma. I only went to the cinema. Eg. We are only going to buy one toy. ——> Nous n’allons que acheter un jouet. Or do we use futur simple (this is a simple tense?) ——> Nous n'achèterons qu'un jouet. That doesn't look incorrect to me - "Marc only ever played football." Marc n'a joué au foot qu'une fois. [Non-native speaker so apologies in advance if I get corrected!]. He only ate sweets: he didn't do anything else but eat them. he ate sweets only: he didn'eat anything else but sweets. Elle n'a qu'embrassé Alex. -- She only kissed Alex. Elle n'a embrassé qu'Alex. -- She kissed only Alex. My native speaking French friends question whether "Elle n'a qu'embrassé Alex" is good or idiomatic French to begin with. I speak fluently and frequently and have never encountered this construction. Parenthetically, to say "She only kissed Alex" isn't even very good English and is at best used only out loud - not in written form - as the phrase is subject to interpretation, i.e. it's not clear. The position of ONLY in English is problemmatic to begin with consider these placement versions. She wanted to kiss Alex only. (She wanted to kiss Alex and no one else - pretty much the same as the preceding placement). To say "she only kissed Alex" where that phrasing means "she merely kissed Alex (and nothing else)", one might say "elle a embrassé Alex, et rien de plus." I know this isn't an English forum, but the above might underline the problems both languages have with placement of exclusionary QUE and ONLY. Personally, I think you're better off trying to avoid both, since both are subject to confusion. I think the example now given does not differentiate between either meaning, that is to say either example can be used to express either meaning depending on intonation when speaking. If I meant that it was only Alex whom she kissed I would use "seulement". If I wished to say that she kissed and nothing else I would say " Elle n'a fait qu' embrasser..."
So far I have found no instance other than this lesson using the construction " n'a que.." plus past participle, rather than " n'a past participle que"
I note that Max shares a similar view. Please would you cite an example in literature where the " n'a que" construction is used. Je n'ai rien fait d'important aujourd'hui, je n'ai que vécu. La sérénité à inventer, d'un geste à l'autre, l'enchaînement des actes... vers quoi ? La vie, simplement. La vie allant vers la vie et se justifiant soi-même. La vie, fin de la vie. Sans but, mordre les choses, les minutes, les espaces. Very drôle but vecu here is used as an adjective not as a past participle. How can it be an adjective after avoir? Of course it's a past participle. You are right. Thank you for the citation. I do, though, find the expression strange. Life, however, is too short to spend time discussing such niceties. I shall continue to avoid such usage, despite the lesson until I have researched it further. I do though appreciate your comments. Frequently I encounter French people who use "que" on its own. Que tu passes des merveilleuses vacances. -- Have a great vacation! Literally: that you may pass great holidays. I hear that a lot too, especially among French millenials, who also frequently omit the subject pronoun. One hears "vendent que des fleurs" meaning "they sell flowers only". It seems there is a tendency to italianize or hispanize French by omitting subject pronouns where the context is clear. Oy veh! How about allowing the women to answer properly with "restée" ? "Restée" is the correct past participle for a female, right? You could program to accept both male and female answers, perhaps. Women and girls need to get in the habit of using the feminine. Yeah, yeah, I know that genderless is coming down the pike, but for now it is incontrovesial that women use feminite forms in French. How elegant it would be if I could write, "Je suis restée." I realize that in this specific sentence, one has to match the "Je suis resté" of the first part of the sentence, but in general, I would I would like to see this work. I will see what happens with other sentences. I have been doing Kwiziiq for a year now and I must admit, I never tried to answer in he feminine when it was unspecified. so maybe I jumped the gun. I would delete the above suggestion if I could. Thanks for you patience. I happen to love Kwiziq. It has helped me tremendously. Just for kicks I tried the female form once in a while and it usually worked just as well. Whenever it didn't, I reported it and it got fixed promptly. Hi Mary Anne - as I think you've realised, we do accept correct inflected forms of either gender so long as the context allows them. If the hint or context specify or imply a particular gender then only the appropriate form is accepted but in general, both forms will be accepted. Similarly, we won't mark answers incorrect for things like capitalisation and punctuation, unless the question or context explicitly requires something specific and it forms part of the test. Lessons are printable. If you are having problems doing so, you can contact the tech team through Help and Support , stating your specific problem and the system you use.